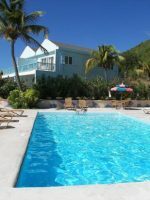 Upon arriving at the St. Kitts Marriott Resort & The Royal Beach Casino, guests will be taken aback by the massive size of the pink palace resting on the bold blue ocean. Being spring break, the resort was at full capacity, yet there were quiet areas throughout the hotel, at the pools and along the beach. The lobby was a calm, welcoming place with open-air views out to the Atlantic Ocean, and upon stepping out of the shuttle, guests are welcomed with a cool towel and cold glass of punch. 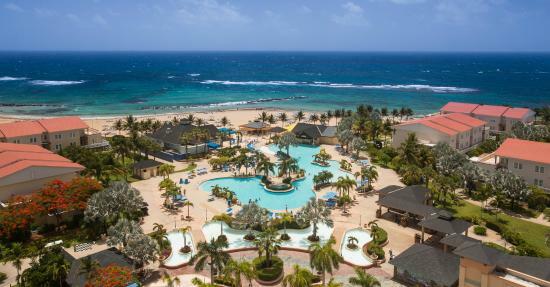 The St. Kitts Marriott Resort, located about 15 minutes from the airport, is a family-friendly resort that strives to make each and every guest feel right at home in one of its 400-plus rooms and suites. 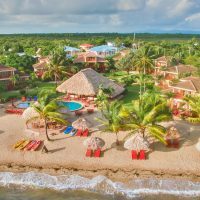 Situated along a gorgeous stretch of sugar-soft beach, the resort features three pools, golf, tennis, water sports, a kids’ program, and a number of on-site restaurants, as well as a casino. The hotel’s pride is its “At Your Service” resource. At any time you need anything, just call on down and they’ll take care of your needs. 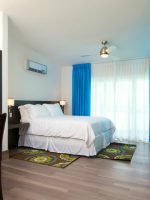 A relaxing place for families to spend time together, it was easy to discover pleasant surprises at the St. Kitts Marriott Resort. The more formal dining options were never booked solid, unlike some large resorts — you know the ones that upon check in you discover all but one restaurant is booked throughout your stay. Local crafters and artisans sell wares on the ground floor, never pushing anyone to buy, and offering low prices and nice trinkets and jewelry for a little shopping at the end of the day. And multi-generational families return to the resort annually, catching up with friends they have made on previous stays. It’s refreshing to find a place that welcomes families of all ages, offering something for all ages. Oversized rooms with marble floors and bathrooms, sand-colored walls, and Marriott's signature bedding that we just cannot resist, are comfortable and inviting. Chaise lounge chairs and standard chairs on the porch provide a perfect in-room breakfast spot, listening to the sounds of the waves crash on Sugar Beach as the gauze curtains of the rooms billow in the wind. 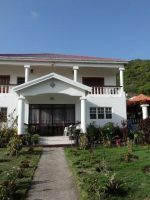 The resort is a combination of a five-story, 350-room main resort flanked on its north and south sides by three-story buildings housing timeshares and villas. 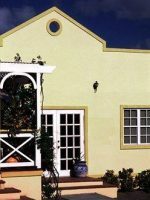 Timeshares are to the south side and are not available to guests, although the pool is open to all guests and is smaller, quieter and geared toward families. The north villas provide 80 two- and three-bedroom accommodations with kitchens and living space ideal for families. Its pool is also smaller and quieter but it's unofficially an adult pool. In the main building, king and double rooms are oversized and many are connecting so families can book two rooms together for more space and sleeping privacy. Suites are located on the fifth floor for even more room. Some rooms are above the casino, which is surprisingly more calm and quiet than most casinos in resorts. Other rooms are above the piano bar, which is open until 2 a.m., so be sure to ask for rooms away from either area if your kids are light sleepers. Don't let this note fool you: this resort is very quiet, even at full capacity. It was a pleasant surprised to feel like we were alone for the majority of our visit. Rooms include mini-refrigerators so you can stock up on drinks and snacks. The resort removed mini bars, finding kids couldn't keep their hands out and parents could get snacks throughout the resort at any time. However, for young ones, bidets are in the bathroom and can get quite messy if they play with them! Our rooms smelled very musty and were just ok. Very poor service with the outdoor bar. Sometimes there was no bartender in sight. There was mold in our bathroom. The restaurants are over priced and the food is fairly average. We ended up eating off the resort. Most of the staff is friendly. The hotels location is great but we are considering staying else where next year. 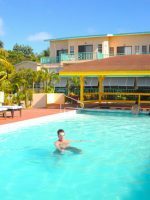 A resort in the Caribbean is an easy sell after a snowy VT winter, but the Marriott St Kitts was beyond our expectations. 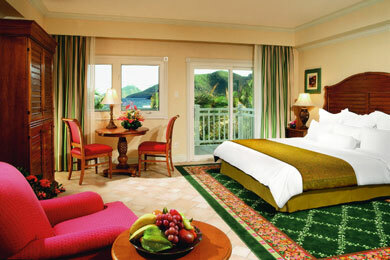 The resort itself is huge, with multiple pools, ocean front, loads of lounge chairs and a variety of dining venues. The beach is on the Atlantic side- so it is breezy, and there are spots of seaweed. However, the staff does an incredible job of clearing the beach daily, and there are coves where the seaweed does not gather. Great room/suite-so spacious, clean, lovely linens and bed was super comfortable. Dameon at the front Door (and all the crew) perfect every time! Jada, Estelle, Danica at Arwee...what a great way to start the day! Rudel at he Pool Bar, you know your stuff! Vincia at Bohemia, it says so much about how well you take care of your customers! Donovan O'Reilly- I am guessing you are a F&B manager...every interaction with any of the staff was just perfect. Thank you! I'd be remiss if I did not end with a huge shout out and thank you to Michael K at the front desk. You made our trip! Our room was amazing, you took care of so many details for us, thank you, thank you! We can't wait to come back. The recreational program is built for children ages 5 to 12 with a staff ratio of 1:8. Kids can spend the day in indoor and outdoor structured activities such as hiking, swimming, arts and crafts, steel drum lessons, and more. Full day programs include lunch and are $45 for the first child, $40 for each additional child, from 9 a.m. to 4 p.m. Monday through Saturday. Half days, from 9 a.m. to noon or 1 to 4 p.m., include snack and are $25/$20. Drop-in programs are available on Saturdays for $10/$8 per hour. Evening programs, held Wednesdays and Fridays, include dinner and are held 6 to 9 p.m. for $30/$25, giving kids a break from their parents and mom and dad a dinner date. A game room is also located at the resort. Beach and pool volleyball are regular occurrences at the resort and pro divers often provide SCUBA lessons in the pool. At the pool activity center, vacationers can rent snorkels, fins and masks as well as pool and beach floats. 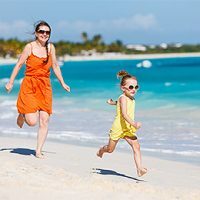 Rides, rentals and lessons for a variety of water sports are available nearby, and the resort is happy to arranged various activities, including deep sea fishing, ocean kayaking, power boating, sailing, snorkeling and diving. The Marriott's four lighted, grass courts are available for players of all ages. Rental equipment is available at the pro shop if you don't bring your own gear. Tennis socials are offered weekly, and group clinics and one-on-one lessons are available with a seasoned pro. 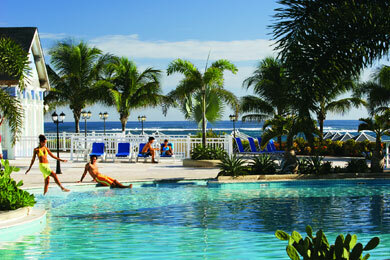 The resort features three pools, as well as a beautiful stretch of sugar sand beach. The North and South pools are tucked into villa accommodations, and therefore more private. Adults tend to hide away at the North Pool, while families prefer the South. The Main Pool is laguna-style with a very unused lagoon wading pool for little ones. Most families stick together near the pool bar, where water is both shallow enough for kids but deep enough for play. On Sugar Beach, 99 wooden cabanas are available at a first-come, first-serve basis, as well as beach chairs outside the cabanas. The beach is public so expect to meet someone selling aloe massages, island excursions or crafts. However, it is never in a pushy, annoying or frightening manner; everyone is very polite and friendly. No matter the time of day or the fact the resort was 100 percent booked during our stay, chairs were plentiful at both the pools and the beach. Sure, a few people snagged their favorite spots with towels bright and early, but there was never a lack of seating and no need to wake up on vacation to rush out and claim chairs. Turns out the owner's wife demanded her husband make sure there were enough chairs after being tired of her own vacations struggling to find a chair on the beach. The blue mesh pool chairs have attached covers on them that can be folded back for full sun, or pulled over the chair for shade. The Marriott's championship 18-hole, 71-par golf course is accessed via complimentary shuttle. PGA-Certified instructors provide private lessons, and a driving range and practice facility are also available. 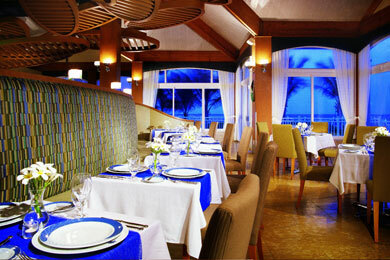 The resort's seafood restaurant features glass-windowed views of the Atlantic and the island's tropical mountains. Fresh seafood dishes are paired with international wines at dinner. Landlubbers can find something on the menu, as well. Family-friendly, it may be best for older children or date night to truly enjoy its ambience. The pool bar provides indoor, patio and swim-up areas to enjoy lunch and snacks from 11 a.m. to 6:30 p.m. The bar opens at 10 a.m. and while some do congregate around the swim-up bar, it doesn't feel like a party atmosphere as tots splash nearby. Happy Hour, from 4 to 6 p.m., is fun for the whole family with a range of musical entertainment, from steel drum bands to Karaoke. Serving breakfast and lunch daily from 7 a.m. to 2 p.m., this lobby-area restaurant has an expansive patio and views of the pool and ocean. The buffet breakfast is filled with all the standards -- muffins, bagels, toast, cereals, eggs, French toast, waffles, you name it -- and a la carte is available for both breakfast and lunch, with kid-friendly staples readily available. A casual dinner is also offered here. The Italian restaurant of the group is open for authentic Northern Italian dinners from 6 to 10 p.m. Both mom and dad can enjoy a quiet date or bring the kids for a family meal. Also located near the main pool, the Pizza Shack, open daily from noon to 10 p.m., offers individual and large deep-dish pizzas, sandwiches, salads, and ice cream. Prices are low, too. Usually, big resorts up the prices a bit, so a pleasant surprise. A more upscale resort alternative (requiring "elegant casual" attire), the classic steakhouse serves up a variety of cuts of beef and fresh seafood, along with an extensive international wine list for dinner only. This setting is better reserved for date night or for the older children who can enjoy a quiet dinner environment. Complimentary Wi-Fi access can be found in the public areas at the hotel. Wi-Fi is also available in the guestrooms for an additional, daily fee. Two fitness centers are located on the resort. The main fitness center includes weights and machines, while the second center provides classes such as spinning. Users of the fitness center may use the neighboring spa facilities for showers, saunas, and steam room. When the kids' program is not enough or children are under 5, the resort is happy to arrange in-room babysitting so mom and dad can enjoy some adult-only amenities (although those are few and far between -- this is a family-friendly resort through and through!). 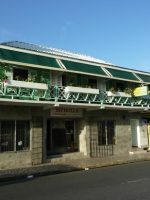 Like all Caribbean islands, St. Kitts experiences hot and humid summers with afternoon rain showers, as well as hurricane season. The best times to visit are December through April, which is also peak tourist season. Several airlines fly into Robert L. Bradshaw International Airport, often connecting via Miami or San Juan. The resort is about 15 minutes away. Rental cars are available but the resort is so massive, there is hardly any reason to leave. When you do decide to leave, tour groups and taxis from the resort are just outside the door. A full day spa providing a plethora of choices from massages to body wraps to mani/pedis to hair treatments, the relaxing spa is decorated in soft blue and greens with natural accents. Try a bamboo massage, or a cinnamon hot stone treatment. The adults can take a gamble and visit the onsite casino.